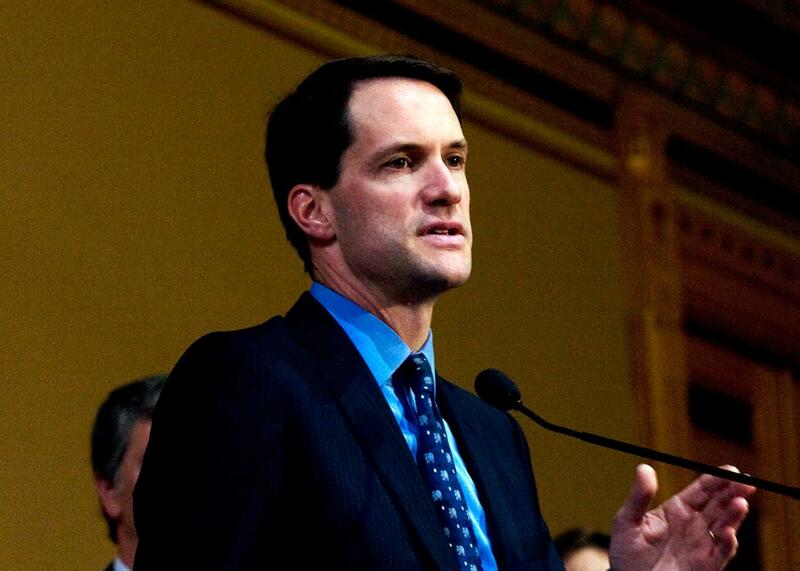 Connecticut Rep. Jim Himes on why the House’s moments of silence are an abomination. Rep. Jim Himes in Hartford, Connecticut, in 2008. Still reeling from the news from Orlando about the worst mass shooting in American history, Sunday night Connecticut Rep. Jim Himes watched a documentary about the 2012 massacre at Sandy Hook Elementary School. Himes, a Democrat, has represented a district near the school since 2009. Newtown follows parents, teachers, first responders, and others in the years following the Connecticut shooting. (The film is scheduled to go into wide release this fall.) Consumed by “an immense feeling of frustration,” Himes, an elder in his Presbyterian church, began tweeting a remarkable and righteous jeremiad against the “moments of silence” that have become Congress’ standard response mass shootings. The Moments of Silence in the House have become an abomination. God will ask you, "How did you keep my children safe"? Silence. God will ask you why you did not defer to the will of the people as children poured out their blood. And we will answer with silence. If whatever God you worship is in fact a God of love and peace you had better use the Moment of Silence to pray for our souls. I spoke with Himes Monday morning, while he was on the train from his home in Greenwich to Washington, D.C. The conversation has been edited and condensed for clarity. Ruth Graham: Tell me where you were when you heard about the Orlando shooting and what your first reaction was. Jim Himes: My first reaction was what my first reaction has been just about every week since Newtown, which is just horror and a sense of—it happened last week, it happened the week before, it’ll happen next week until we finally do something. Graham: The language in your tweets almost reminds me of an Old Testament prophet. Why did you use that tone? Himes: I’ve spent eight years in Congress avoiding moral language. I represent a swing district. I believe profoundly in not challenging the motives of your opponents. But more and more, we’re in a world where leaders have to speak up, and speak in strong moral terms. Graham: Tell me what typically happens in the House after a mass shooting. What are these moments of silence like? Himes: We’ve done a half-dozen of these already this year. As I told someone else yesterday, we should be shouting the names of the people who are killed in preventable violence, not standing there in some mock and tepid ritual of sanctity—this smug “We care” statement in the face of gross negligence. I’m not going to be part of it anymore. Graham: Does everyone attend the moments of silence? Will it be noticeable that you’re not there? Himes: I sense a similar frustration in many of my colleagues. I’m on my way to Washington now, and I’m going to make an argument to my colleagues that we ought to step off the floor and read the names, that we shouldn’t participate in this pathetic ritual anymore. [Connecticut Sens.] Murphy and Blumenthal called us complicit. Silence is perfectly emblematic of the gross negligence that’s been shown. We shouldn’t be part of it. … I’m not going to tell others how they should best respond to a tragedy. But I’m sure as hell not going to be a part of it anymore. Graham: There are always elected officials who tweet “thoughts and prayers” at times like this, and who perform these public moments of silence. Is it different in private? What are your conversations with colleagues like at times like this, off Twitter and off the floor of the House? Do real conversations ever emerge in the wake of these shootings? Himes: No. They don’t. Never. “Thoughts and prayers” are three words that cost you nothing. I’m sick of it. Show some courage. There’s an array of pathetic arguments with the ideologues you hear, that we can’t ever end gun violence. That’s true. We’re not going to end polio or cancer, either, but we can take some huge strides. Part of why I chose to use the language I did last night is that for some of these folks, you need to use almost Biblical language. I’ve been profoundly influenced—you’ll get a kick out of this, I’m a New England Democrat—but I’ve been profoundly influenced by Rev. Rob Schenck, the leader of a very aggressive pro-life movement. He comes out of that tradition of evangelical activism. He had an epiphany where he said there’s no way on God’s green earth that Jesus Christ, if we have any understanding of what he stood for, would tolerate what the Congress is complicit in. There’s a wonderful movie—if you haven’t seen it already you’ve got to see it, called The Armor of Light—and it’s how I met Rob, which traced his journey to this point. He says to his white Southern evangelicals, “This can’t possibly be what Jesus wants us to do.” So I’ve been profoundly influenced by this guy with whom I share almost nothing politically and his moral courage. I think it’s going to be strong moral language that wakes Congress from its torpor. Graham: You told someone on Twitter yesterday that you are happy to debate the theology of your statements. Can you tell me about the theology that informs your point of view on this issue? Himes: If you’re a Christian you can point to just about everything Jesus Christ ever said, with respect to turning the other cheek, with respect to “blessed are the peacemakers.” Equally importantly, if we want to examine how the faith community thinks about gun violence, pretty much every faith tradition has made powerful statements in favor of gun safety policy. This is interesting ground on which to stand, because the religious case for congressional action could not be stronger. Graham: Can you tell me about your own faith? Himes: I want to be a little careful. It’s not my job to preach; it’s my job to do what I think is right. I have pretty significant feet of clay, like everyone else, so I’m not going to wrap myself in virtue. But I’m an elder in a Presbyterian church. I’ve taken Scripture seriously. I really do believe, like my more religious colleagues, that religion should be a source of values. If you believe that, for God’s sake, act on those values. Graham: Does prayer still have a role to play after an event like this? Himes: I would never denigrate prayer. It’s important to people; it’s important to their spirituality. It’s not enough. It’s not enough. Prayer did not stop Orlando. It did not stop Newtown. It did not stop Aurora. It did not stop San Bernardino. Clearly, more is called for from us.